By John Kruzel on Thursday, February 22nd, 2018 at 12:06 p.m.
"Their playbook is to basically to pit Americans against each other," Jamie Fly, a senior fellow at the foreign policy think tank the German Marshall Fund previously told PolitiFact. "It’s not even based on party identification, but people on either side of social or cultural divides." Following the Feb. 14 shooting at Marjory Stoneman Douglas High School that left 17 dead, an army of human-controlled and automated accounts spread related content across Twitter. According to the German Marshall Fund, which tracks Russian-linked Twitter activity, the following are some of the more popular narratives, themes and articles. One of the most high-profile conspiracy theories to emerge from Parkland concerns two outspoken survivors of the school shooting. The bogus theory holds that David Hogg and Emma Gonzalez are not actually students at Marjory Stoneman Douglas High School, but rather paid actors who travel from crisis to crisis, giving phony interviews to media outlets along the way. Among Russian-linked Twitter accounts, one of the most popular articles to cast doubt on Hogg’s authenticity comes from the conspiracy-minded website TruePundit, according to the German Marshall Fund. "The ‘crisis actor’ narrative has been the most prevalent conspiracy theory," said Bret Schafer, a top analyst of Russian-linked Twitter activity at the German Marshall Fund. 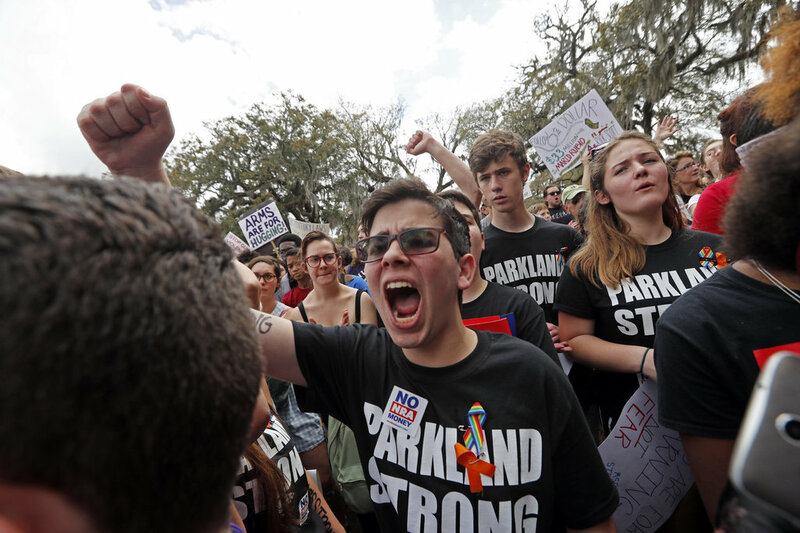 After an aide to a Florida state lawmaker pushed the crisis actor conspiracy to a Tampa Bay Times reporter, Broward County Schools Superintendent Robert Runcie told the newspaper the notion was "outrageous and disrespectful." "These are absolutely students at Stoneman Douglas," Runcie told the Times after leaving his fourth funeral of the day. "They've been there. I can verify that." Hogg himself responded to the accusations, telling CNN, "I am not a crisis actor. I'm somebody that had to witness this and live through this and I continue to have to do that." Russian bots pushed hashtags that promoted the idea that the Florida shooting was a "false flag" operation orchestrated by unseen powers. A common culprit is the "deep state," a supposed hostile faction within the American government working to take down President Donald Trump. One theory associated with these hashtags is that Marjory Stoneman Douglas High School was targeted because the school’s namesake was opposed to "draining the swamp" of the Florida Everglades. Under this theory, the Parkland shooting was a cryptic message to Trump, who vowed during his campaign to "drain the swamp" in Washington by hollowing out its infrastructure of career politicians, insiders and influence peddlers. Other theories imply the media was a co-conspirator in the shooting. "There were a variety of different theories thrown around," Schafer said, "including casting suspicion on the media’s ability to arrive at the scene so quickly." This Feb. 15, 2018, chart from the German Marshall Fund shows Russian-linked Twitter accounts’ top trending topics over the previous 48 hours. As we’ve previously reported, Russia has used social media to deepen divisions over issues both big and small, from undermining Trump’s legitimacy, to playing both sides of the NFL protest debate, to fomenting anger over a coffee machine maker’s boycott of a Fox News program. In the wake of the Parkland shooting, some simply exploited the event to heighten political tensions. "The shooting was the central topic over the past week. But anytime we’ve seen a breaking story with a wedge issue that Americans are passionate about, we’ve seen this type of concentrated focus," said Schafer, noting a similar pattern of activity after the 2017 Las Vegas shooting that killed 58. Russian accounts boosted erroneous content concerning the motives of the alleged shooter Nikolas Cruz. In a related fact-check, for example, we gave the claim that "the mass murderer was immersed in Islamic and leftwing hate" a Pants on Fire. According to the German Marshall Fund, one of the top links shared by Russia-linked accounts in the aftermath of the shooting was our 2014 article that largely debunked a statistic cited by pro-gun control group Everytown for Gun Safety. Our internal analysis shows an uptick in the number of visits to that article immediately following the shooting. PolitiFact traffic from Feb. 13-17, 2018 for an article from June 13, 2014 largely debunking a statistic cited by pro-gun control group Everytown for Gun Safety. While Russian-linked accounts might appear to oppose traditional or "mainstream media," Schafer said, oftentimes they harness the credibility of these sites when it advances their agenda. "By linking-to a highly credible source that has questioned a finding by a gun-control group, Russia-linked accounts were able to fan partisan flames by questioning the veracity of one-side of the gun control debate," Schafer said.